With the summer months quickly approaching it can mean only one thing– it’s grillin’ season. That’s right, it’s finally time to turn off the oven, throw some lighter fluid on those coals, and get grillin’. But before you go ahead and mindlessly throw on some stale, cheap quality, bacteria-infested meat on those ever-so-lightly oiled grill grates, let’s get one thing straight. If you want a truly great hamburger, you must grind your own meat. It doesn’t matter if it’s pork, chicken, beef, turkey, salmon, etc.– it all benefits greatly from being freshly ground. To begin, you have complete control over the quality of the meat that goes into your burger. There’s no telling what quality and how old that pre-ground stuff is. And for the health conscious, there’s a little known fact about pre-ground meat. It’s a haven for bacteria growth. 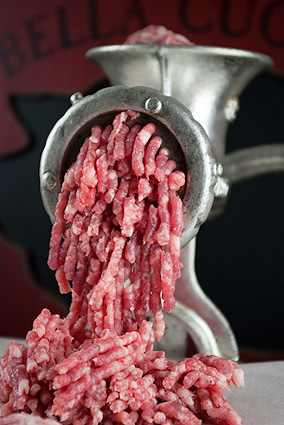 You see, grinding meat increases the surface area in which bacteria can mingle and infect your meat. Let it sit on the shelf for a few days and… I think you get the point. This has numerous consequences in your quest for a great hamburger, most namely that you’re much more likely to get sick. But what’s important from the cook’s perspective is that the meat must be cooked to a higher temperature to ensure that the bacteria is killed and the meat is safe to consume. The resulting burger is dry, tasteless, and anything but a good. Not so with fresh ground meat. Need another reason? What if I told you it’s cheaper and will pay for itself eventually? It’s simple economics, any processing that occurs in the production of a product increases the price to the consumer. Publix has to grind your meat? They make you pay. Want a pre-seasoned hamburger? Jack up the price. It just so happens that a whole chuck roast is anywhere from $0.20 to $1.00 cheaper per pound than it’s ground counterpart. With a top of the line Porkert manual meat grinder costing a mere $30 on eBay, it’s not hard to see how, with consistent use, it’ll pay for itself soon enough. But what about the real kicker… Does it taste any better? Is the texture better? Is it really worth the extra time and effort? My answer– an overwhelming, all-American, lettuce, tomato, and Heinz-57 covered hell yes. There’s nothing like a burger taken straight from the grinder to the grill. Tender, juicy perfection doesn’t even begin to describe it. It’s just that much better, no questions necessary. And did I mention that a meat grinder is more versatile than you ever imagined? Need a mixture of veal, pork, and beef for meatballs? Consider it done. Want an out of this world meatloaf? No problem. Want to experiment with making your own signature sausage? Get a sausage making attachment and go for it! Making a spicy pork and cabbage filling for pot stickers? Look no further. Wondering how you’re going to grind all of those cranberries for Thanksgiving? Problem solved. Want to make some old school, ground Pimento cheese? You got it. Seriously, the list goes on and on. Hopefully I’ve at least forced you to consider the idea of grinding your own meat. If so, these tips should make the transition between pre-ground and freshly ground a smooth one. Always, always, always put the grinder in the freezer before you grind the meat. It will turn to mush if you don’t. Cut the meat into small strips, not chunks, and place in the freezer until partially frozen or just very cold. For large projects, work in batches, keeping the unground meat in the freezer while you’re working. Clamp the grinder to a very sturdy table and use an extra pair of hands if you’ve got them. If you have some stale bread laying around, run it through before you soak it. It will force the nasty bits out without scrubbing. Thoroughly dry immediately after cleaning to avoid rusting. Store in a plastic bag filled with a bag of uncooked rice. The rice will absorb the ambient moisture and prevent the parts from rusting. If the unit does rust, steel wool is your best friend. Don’t worry, in most cases it should only take a light scrubbing to remove. great tips! i’ve been grinding my meat for the last year and i don’t know how i could’ve bought ground meat before, its scary to think about how many years i’ve been eating god knows what. anyways, helpful tip that i’ve found with my burgers is not to salt them until the patties are formed and within 10min of the grill. any earlier and it will pull moisture out. have a great grill season! Yep, I def. agree not to salt until you’re ready to grill. I’m also not a fan of putting anything inside the hamburger — just season the outside. All of you out there stuffing bacon, cheese, and whatever else into a burger know who you are, lol. This was really informative and helpful! My mother in law grinds her own meat for certain Middle Eastern dishes that she makes! I’ll be pinning this to save for later, and I’m going to look into meat grinders now.